Experience a classic American college town—a community built around the university and its students. For 125 years (and more), the town of Pullman and its university have grown and developed together to form a vibrant, student-centered community. University students comprise 65 percent of the town’s 31,000 residents. Local professionals, WSU faculty and staff, and their families round out the population. The downtown shopping district—with coffee shops, specialty retailers, and restaurants—is only a short walk away from campus. Convenient bus routes provide access to grocery stores, department stores, movie theaters, and more restaurants. WSU students use Pullman’s excellent public transit system free of charge, and the University’s bike-sharing program gives you another easy way to get where you need to go. Safewise.com ranks Pullman No. 10 in its list of the safest cities in the state of Washington. The Princeton Review includes WSU in its list of 20 U.S. colleges that have remarkably positive relationships with the nonstudent communities around them. WSU nestles in a wide-open landscape of gently rolling hills that is one of North America’s most productive agricultural regions. The International Center helps all students have a cultural sharing experience on campus. The International Center is your campus living room—a comfortable place where the international and local community come together for intercultural activities and programming or to simply relax, socialize or study. Academic support services, social events and programming, in collaboration with the International Students’ Council help highlight cultural customs and uniquely U.S. experiences while providing students help in succeeding at the University. Coffee hours are held Friday from 3 – 4 p.m. Topics vary and cover U.S. culture, international topics, WSU and Pullman resources and more. New students can benefit from the Becoming A Cougar: American Life and Culture series. This program helps students navigate the University environment. It provides additional support by educating students about a variety of topics, including WSU Athletics, local travel and transportation, health insurance and academic integrity. International students are encouraged to attend these programs where they can practice English and learn about U.S. culture through casual conversation or by playing board games with domestic students, community members and WSU staff. Domestic students can gain intercultural communication skills and learn about other cultures and languages. Both of these programs are open to everyone. English Conversation Tables are held Tuesday and Thursday from noon – 2 p.m.
English with Board Games takes place Friday from noon – 2 p.m. and 4 – 6 p.m.
We want you to be happy here, and we know that beginning college in a foreign country can be a stressful experience. That’s where peer mentors come in. The international peer mentors are a group of friendly volunteers—students like you—who are ready to help you get a good start at WSU and seize the opportunities of American college life. You will meet them during orientation week, and they will be available to offer guidance throughout your first semester at WSU. There is a strong sense of kinship that comes with attending WSU. In fact, it is one of our most distinctive traits. Everyone who attends WSU is a Cougar—in short, a Coug—for life. Like many U.S. universities, WSU has a school nickname. Ours is the cougar—the largest feline predator in North America. Butch T. Cougar (our costumed mascot) is a focal point for the friendship and loyalty that define the student experience. The University’s athletic teams compete under the Cougar name. Students and alumni proudly wear the school’s crimson and gray colors to identify themselves as WSU Cougars. Whenever WSU alumni meet, “Go Cougs!” is a common greeting. 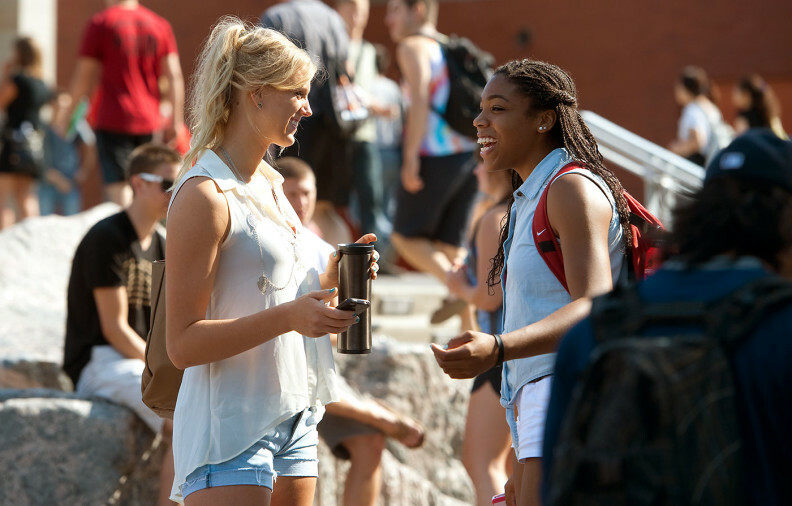 The rural setting and diverse student population of WSU Pullman create a powerful learning experience. Whatever your interests may be, you can find people at WSU who are eager to share them with you. International and domestic students participate together in more than 300 student clubs and organizations. WSU students enjoy the University’s spacious, well-equipped student recreation center. The University’s Outdoor Recreation Center offers equipment rentals and group trips, in which you can enjoy activities such as hiking, skiing, snowboarding, surfing, backpacking, and kayaking in locations throughout the western United States. There are also classes where you can learn new skills for the outdoors. WSU has a very robust intramural sports program. Students of all skill levels are welcome to join teams and participate in friendly competition with their fellow students.